Lake Park is Forest Hill’s sister community located in Oakland, CA with amazing views of Lake Merritt and the East Bay Hills. Lake Park is set in a vibrant location in the heart of Oakland’s renaissance, where there is a resurgence of cultural activities and restaurants, as well as entertainment and shopping offerings of Jack London Square. There is also easy access to Oakland International Airport, BART (Bay Area Rapid Transit), Amtrak and the ferry to San Francisco. Lake Park offers maintenance free living with plenty of flexibility. The Independent Living floor plans range from studios, roomy alcoves, one bedroom with one or two baths, to spacious two-bedrooms. 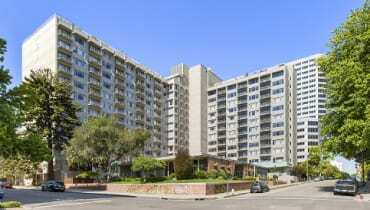 And many residences offer stunning views of Lake Merritt or the downtown Oakland area. We are happy to help you choose the option that suits your lifestyle, and pets are welcome too. Assisted Living at Lake Park provides help to those who enjoy their independence but need help with daily activities now and again. Whether it’s assistance with dressing, bathing or keeping track of medications, you can count on specially-trained, licensed professionals to provide around-the-clock support, within the privacy of a comfortable, gracefully-designed apartment. For more than four decades, Lake Park has delivered personally-tailored health care services to seniors and their families. Our Medicare-certified Health Center ensures specialized care in a comfortable homelike environment that’s focused on enhancing quality of life for both residents and their families. Learn more about all that Lake Park offers.